The Frugal Family Life: $1/1 Honey Bunches of Oats Coupon = Cheap Cereal! 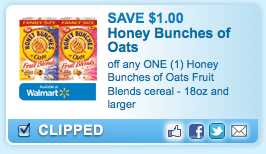 There's a new $1/1 Honey Bunches of Oats with Fruit Blends cereal coupon available right now on coupons.com! This should make for a super deal at a store that doubles! It often goes on sale for around $2.50 so possibly $.50 after coupon! !